In weeks 1 - 3, we covered weight shift, tension and swing arc. Today, for week 4, we are adding in one more piece that will get you in the best position for crisp and pure impact. This week, we will be combining all these steps and keeping your eyes quiet and legs under control during the golf swing, you will be in near-perfect position when you get to golf ball impact. In this golf lesson, we want you to set up a ball in address position off your left ear. To start the drill that focuses on your leg and eye movements, we are going to show you how to properly shift your weight while focusing your left eye on the back of the golf ball. The key here is to create a repeatable and solid swing base that will allow us to increase swing speed and taking full swings during our practice session. We want you to perform 1000 reps of this drill so that you can get the muscle memory needed to create a consistent swing. Watch this lesson, practice the specific swing sequence moves and you'll be ready for golf lesson 5 next week where we will be taking full swings and using flight scope to track results. This week we're going to be adding one more moving piece to our ball striking that's going to allow us to become a much more consistent ball striker. We're going to be focusing on how important it is to keep your eyes very quiet at the release point of the golf swing. So over the first few weeks what we focused on was, in week number one, we wanted to minimize a lot of that additional head movement or excess head movement that you may have had in your takeaway, your backswing. In week number two, we worked on shaking out a lot of that tension that you may have had in your wrists, your forearms. Then week number three, which is a really critical week, we worked on controlling the bottom of the swing arc and adding weight transfer to help get the gulf club to bottom out in the same spot every single time. So this week what we're going to be focusing in on is we're going to be keeping our legs stationary. We're going to get into proper stance with, and I want you to go ahead and get a ball in its normal position here, just off the left here, just like we talked about in last week's video. We're not going to be hitting this golf ball unless you're going to be out at a range or what not, but I'm going to have this golf ball position right up off my left ear, and what I want to do here now is we're going to tie all these pieces together, we're going to make sure when we start our move we're going to pick our right heel up, and we're going to push it in the ground, and we're going to turn our body all the way to the top of the golf swing. Okay, so I'm going to stop at this point, and then what I'm going to do is I'm going to shift my weight over to my left heel, so you're going to see that my head moves back into it's original position. I'm going to shift so I've got about 85% of my weight in my left heel right here. Then at this point what I'm going to do is I am going to now focus my left eye right directly on the back of the golf ball, and I'm going to leave it there until I feel my hands and arms reach up to about belt height when it passes impact here. So I'm going to go ahead and load to the top, so I'm going to pick my right heel up, turn my body to the top. I'm going to shift my weight left, so I got to feel about 80% of my weight in my left heel, left ankle. I'm going to focus my left eye on the back of the golf ball, and I'm going to let the club release. Now the reason why I have this ball out here, number one, I'm going to get you comfortable, it's going to give you a reference point, and number two, we're going to be looking for the club to still bottom out just in front of this golf ball just like we worked on last week. Again, so the way this drill's going to work, right heel up, push it in the ground, turn your body, transfer your weight over to your left heel. Then once your weight's over your left heel you're going to focus your left eye right on the back of the golf ball, push your left heel in the ground, and let the club release, and keep your eye focused back here on the golf ball until your hands reach belt height. I want you to do a thousand repetitions of this exact move. Start very slowly and start to get yourself up to speed by probably the 800th, 900th rep or so. You want to start to almost feel like you're at full speed, and then in turn you're going to be ready for next week's video. So let's go through this just one more time for you guys. Ball position's going to be up off my left ear. Pick my right heel up, push it in the ground, keep my right leg flexed. I'm going to shift my weight over to my left side, left eye's going to stay focused on the back of the golf ball, push the left heel into the ground and let the club release in front of our body, no tension. Now for those of you people that have battling with maybe a chicken wing or maybe a flip, you've got a different set of homework this week. What you're going to be focusing on is when you shift your weight left, you're focusing your left eye on the back of the golf ball, and you're letting the club release, your right hand is going to be coming off the golf club at impact. It's not going to be passing impact. So you're going to do a thousand reps with your right hand coming off the golf club right at impact. If you've been struggling with a flip or a chicken wing, those are what you're going to be focusing on this week. Your right hand must come off the golf club. Then next week what we're going to start go to do is we're going to start to ramp our speed up. We're going to start working on controlling our starting line. I'm going to have flight scope out here, so we're going to start tracking some of the data, start tracking our speed, start tracking the path of the club, and then the face to path, and you're going to see that we're going to get well on our way to playing some really good, consistent golf. All right, so there you have it. Week number four, we're going to go ahead and add weight shift, going to keep our eyes quiet, let the club release. We're going to aim for a thousand reps. I wish you guys all the best success for this drill this week. Also, I want to let you guys know if you're unclear on how to properly shift your weight into your lead side and help keep your hips back when doing so, we've got a fantastic video on the website. It's a premium video called Sitting into the Left Side. This is a video that's mandatory for you to check out if you're unclear on how to shift your weight properly in your golf swing. Also, we did a video that helps a lot of our members try to overcome some of the faults that they had when working on sitting into the left side, it's called Fixing Weight Transfer. Both of those videos are going to be recommended videos over to the right hand side of the video player that you can go ahead and check those out. They're going to be really critical for you to have those moves down perfect when working on moving your weight back over into your lead side. All right guys. So good luck this week. We'll see you guys next week for week number five. We start getting more and more advanced. I hope you guys have some great success. Feel free to post those comments up below. 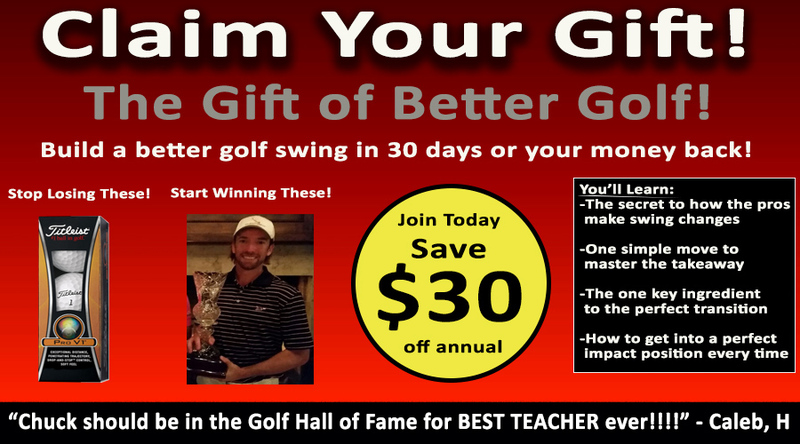 Get Your Free Membership to Finish Watching "Play The Best Golf Of Your Life in 6 weeks | 4 of 6" Right Now!